Model 8500 is a modern universal source of test stimulus waveform. Its flexibility ensures continuing usefulness for a variety of tasks today, as well as in the future when demands change. Its versatility, reliability, programmability, and economy make it equally at home in engineering research laboratories, production test stands, automated systems, or in maintenance shops. 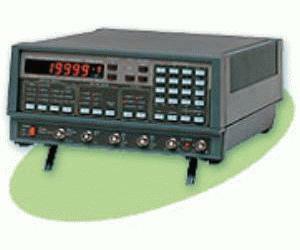 Although providing wide 70 MHz frequency coverage and large 32 V amplitude span, this generator is very affordable.